As a daring darling in the fashion world, Rihanna is all about going with her gut and carrying herself with confidence in some of the most “risqué” or “unpredictable” ensembles. Coming out of her big debut collection at NYFW, Rihanna is moving right along and is ready to drop her PUMA Fenty Trainer. Coming in “Blackout”, “Whiteout” and “Red Alert”, this sneaker stays true to the popular hybrid appearance of a lifestyle and performance shoe. 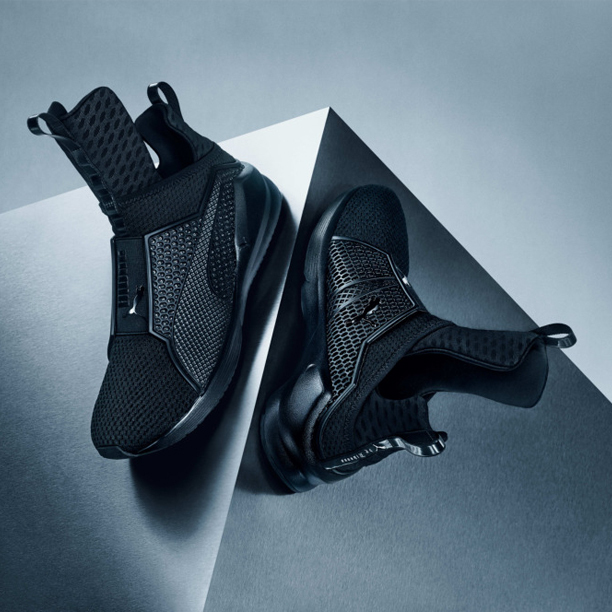 Besides the distinct, standout tongue, the Puma Fenty Trainer is also laceless giving off a very innovative design. The sneaker is a perfect representation of Rihanna’s entire collection at NYFW and critics seem to admire her vision. If we know anything, we know the PUMA Fenty Trainer will have everyone talking, snapping or posting. You can be a part of the Rihanna x PUMA Fenty Trainer hype and cop a pair when it’s available Friday, 2/26 at finishline.com.